Billed as ‘the scariest film of the year’ and even drawing glowing comparisons to one of the genre’s pinnacles in ‘The Exorcist’, it’s fair to say that ‘Hereditary’ comes with a lot of expectation riding on it. It is first and foremost a film about death and the grieving process, picking up with a family as they bury their grandmother and struggle to cope in the aftermath. We primarily see this through Annie Graham (Toni Collette), a miniaturist artist who had a fraught relationship with her mother and to some degree is struggling to reconcile those feelings after her death. Her husband is played by the ever-reliable Gabriel Byrne, with Alex Wolff and Milly Shapiro filling out the family as their children. I thought the film was incredibly effective at building a creeping tension and an atmospheric mood, however I did feel the ending let it down somewhat (which I will not go into because of spoilers). The film is the feature directorial debut of Ari Aster and he has a clear mastery of mood and space, utilising the spacious house of the Graham’s to great effect and every element of the frame to build a sense of foreboding. He is aided by higher calibre than normal performances for the horror genre with Collette the clear standout as the increasingly tortured Annie, and the rest of the cast (including Ann Dowd as a support group friend) delivering strong displays as well. I liked how the film toyed with the supernatural elements, with the characters initially reacting as anyone would by dismissing it until it becomes clear all is not as it seems, and the film does deliver some truly terrifying imagery. Whilst I do think it lost its way a little towards the end (and I can think of a couple of endings that would have worked better for me personally), the film’s greatest success is in how it feeds on the nature of trauma and the effect it has on people to horrifying effect. The film cleverly drops in plot elements that will be delivered upon later and I felt it toed the line well between the genuinely supernatural and the potential that what the characters are seeing is a manifestation of their inability to cope with loss. I mentioned at the start that ‘The Exorcist’ has been cited as comparable, however Roman Polanski’s classic chiller ‘Rosemary’s Baby’ is a closer contemporary in tone and narrative and I have no doubt it was a primary influence. 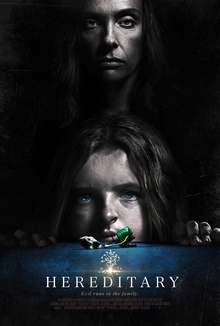 I don’t think ‘Hereditary’ is the masterpiece that it has been called in some quarters but I did find it to be a deeply disturbing, effective horror movie and I would recommend checking it out for yourselves.